New analysis of the well-known photo by Eric Shipton and Michael Ward, which shows the footprint of an unknown animal on snow in Himalayas, is carried out. It was found that the photo contains overlapped traces of two similar, but different hominoid exemplars. 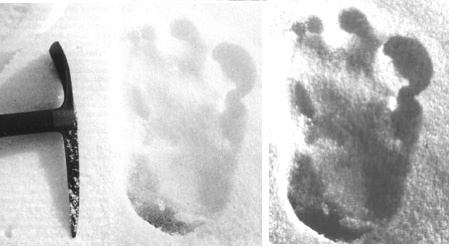 The interest to mysterious animals that seems much more man-like, than large apes, became general soon after Eric Shipton's and Michael Ward's publication of the photo of a footprint on the snow in 1951 . The footprint was clear enough and its dimensions were measured. The print belonged to a large animal ¾ it was 13 inches (33 cm) long and 8 inches (20 cm) wide. The line of the footprints showed that it walked on two legs like a human. No known animal could leave such prints. Fig. 1 Photo of footprint of an unknown animal made by Shipton and Ward. On the right frame ¾ the same image showing additional details of the surface. Eric Shipton told in his books about the circumstances when the photo was made. "It was on one of the glaciers of the Menlung basin, at a height of about 19,000 feet, that, late one afternoon, we came across those curious footprints in the snow, the report of which has caused a certain amount of public interest in Britain. We did not follow them further than was convenient, a mile or so, for we were carrying heavy loads at the time, and besides we had reached a particularly interesting stage in the exploration of the basin. I have in the past found many sets of these curious footprints and have tried to follow them, but have always lost them on the moraine or rocks at the side of thc glacier. These particular ones seemed to be very fresh, probably not more than 24 hours old. When Murray and Bourdillon followed us a few days later the tracks had been almost obliterated by melting. Sen Tensing … had no doubt whatever that the creatures (for there had been at least two) that had made the tracks were "Yetis" or wild men". This description may be extended with interview, which had given by Shipton later to Daily Mail. (I can't get the original English text, so the following is back translation from Russian ¾ M.T.). "This photo is especially successful, as the footprint was pressed on a thin layer of crystal snow laying atop of firm ice. Therefore, when the animal had moved the leg forward, the footprint almost was not deformed. The prints, absolutely fresh, were left, probably, only some hours before we had found them, and at this very day anyway. They were at distance 75 cm one from another and followed in the direction to a crevasse. In the place, where we had found the prints, probably two animals moved together. We were at height about 5500 meters, that is much more high than forest level. There were two lines of prints, one near to the another, and they crossed in some places. I did not mention till now that I paid special attention to the place, where one of animals had to jump over a crevasse of about 90 cm wide. I could see clearly where the creature had deepened its toes in the snow. I regret, that I had not photographed this footprint on the other side of the crevasse". Let us consider the photo, Fig. 1. The footprint belongs to a large animal. One can see, that its foot has wide heel and not long toes. The large thumb considerably wider than others finger, but it is shorter and obviously stronger. The near to it finger is also strong, so it is seems not as mighty as the thumb. It is stretched out forward and bent somewhat inside that resembles ape's foot fingers. Probably, they both serve for the basic support when the animal moves on two legs. Other two fingers are much reduced and form almost straight line with tip of the middle finger. Possibly they play auxiliary role in walking. They also give an impression that their phalange bones are partly knitted. 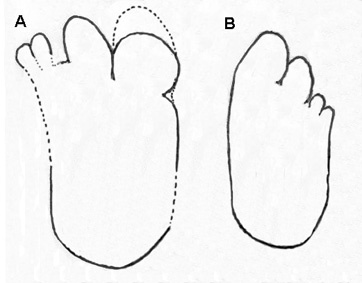 The general contour of a foot is also unusual. The footprint is concave on the side of reduced fingers. It seems so, that small fingers are on the inner part of the foot and strong fingers are on external, but this assumption contradicts to all available data on feet of apes. Inside of the footprint there is seen some ridge-like formation across the heel. A few separated lumps of snow are seen below it. In above mentioned citations E.Shipton said, that in the place where photo was made, two lines of steps led in the same direction. I suggest that peculiarities on the Shipton photo can be caused by overprint of feet of two different exemplars - at first the larger animal stepped on snow, and then the smaller animal put its foot on the same place. The contours of these prints are seen clearly enough on original photo and are emphasized at Fig. 2. Fig. 2 The contours of the overprinted footsteps. The large thumb of the second animal over-covers the part of small fingers of the first print, that gives an illusion of their knitting. Other details of the second footprint are also seen. 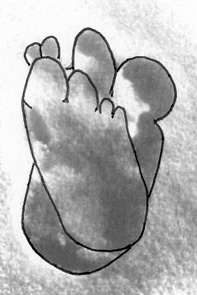 width of the foot through phalange joints - 13,5 cm. Fig. 3. Contours of footprints made by two exemplars, received from Shipton photo. A - the first print by the larger one, B - the extracted line of the smaller one. The contour of the print of larger animal in those parts, where it was covered by another, is executed by a dashed line. Both prints have the similar form in general and most probably belong to animals of a same unknown species. They have four fingers, two of which are large and strong, and two are reduced small at external side of the foot. The large thumb on the second print extends forward as others and finger tips form a line almost straight. It allows to assume, the thumb in the print of first exemplar is not immanently short and could be extended also. In such case it can have a contour, as it is shown by dotted line in Fig. 3A. The researchers of hominoids know that fingers on their feet are very movable in comparison to human. They can turn in the fingers and move them widely apart according to kind of the ground the animals walk on. These peculiarities are noted, when lines of footprints were followed. It is quite probable, that the unusual view of thumb print was due to the first animal bent it and dig in snow as a hook. The measurement gives its foot length with stretched finger about 35 cm. The second animal put its foot on already firm snow, and it had no need to use fingers in such a way. The characteristic relation of foot length to heel width for both animals are near: 35/16=2,2 for the first one and 28/12=2,3 for the second. It is necessary to note that anthropologist John Napier earlier  considered possibility that this footprint is overlapping of two. But he thought, that these are fore and hind paws of snow leopard. J.Napier never counted Shipton photo as a fake, though there were such statements elsewhere in press. In my opinion the carried out analysis removes doubts that this snow print was done by unknown hominoids. 1. Shipton Eric, Mount Everest Reconnaissance Expedition, 1951. 2. Napier John, Bigfoot: The Yeti and Sasquatch in Myth and Reality, 1976.